During the hot season, it can get very uncomfortable in the office or at home, especially when you don’t have the means of cooling your space. If you are thinking of investing in an air conditioner and don’t want a bulky unit or are concerned about the wall, then a ventless portable air conditioner is just what you need. In this article, we are going to help you determine and pick the best model for your home or office. We’ve shared below a list of five of the best ventless portable air conditioners available on the market today. There are also a few important things you need to keep in mind before purchasing a ventless portable air conditioner. We’ve covered these as well in this comprehensive guide. Covers up to 320 sq. ft. Covers up to 650 sq. ft. Covers up to 950 sq. ft. Covers up to 200 sq. ft.
You need to choose a unit that’s capable of handling the amount of space you want to cool, otherwise it may not be effective. For example, one of our top picks below can deliver up to 1650 CFM, which means it can cover rooms that are up to 650 sq. ft. in size. Another model has a 525 CFM rating. It can cover no more than 320 sq. ft. Therefore, determine the size of the room or space you want to cool, so that you can figure out which model will offer the appropriate output. Luckily, most air conditioners include information on the maximum space they can cover along with the CFM rating in their description. The next thing to consider is the convenience factor. The majority of ventless portable AC units have an array of useful features like a programmable timer, auto restart function, digital display, and remote control. Ventless portable air conditioners, as their name suggests, are essentially designed to be portable. However, as much as they are portable, weight is a major concern, especially when it comes to lifting them up and down stairs. Aside from weight, consider also the height of the unit. You want to choose a unit that’s light enough for one or two people to carry and not extremely tall, just in case you have to transport it in your car. Whether you are getting an AC unit for your barn or living room, it will require water, and each unit has a tank. Therefore, you should ensure the model you choose has a fairly sizeable tank, preferably more than 7 gallons, so that you don’t have to refill it frequently. Finally, if you are going to use the unit indoors, the amount of noise it makes is an important consideration. Not all models will have the dBA rating included in their description; however, we’ve included the ratings for each of our picks below. 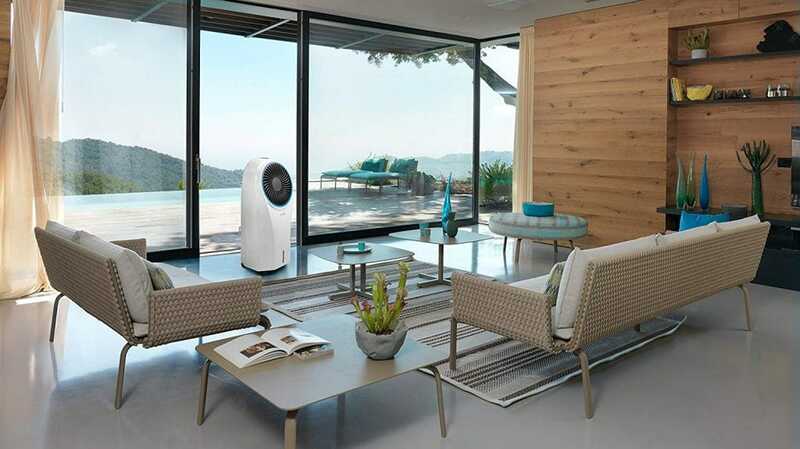 Generally, ventless portable air conditioners are fairly quiet, but if you want the least noise possible, you should consider models that have a rating of around 50 dBA or below. Now that we have touched on a little bit of background info, let's move onto what matters most -- the review. Below is a complete overview of our top picks. Can cool small to medium-sized rooms up to 320 sq. ft.
Honeywell is a brand that has always had a great reputation for its quality products, and their CO30XE ventless portable air conditioner is no different. It’s an excellent machine built to offer superb performance while being very cost effective. The CO30XE is a solid air conditioner with a powerful 525 CFM fan that will efficiently distribute cooled air into the surrounding area. While it does not have many cooling pads, the unit’s wet honeycomb cooling medium is very effective on its own. It absorbs all the heat from the drawn air, so combined with the powerful 525 CFM airflow, this unit will comfortably cool small to medium-sized areas of up to 320 sq. ft. The unit can also help humidify the air during the cool weather months. It features an adjustable humidity control that lets you set the moisture level of its cooling media to ensure optimal relative humidity levels within your space. The water tank has a capacity of 7.9 gallons, which is a fairly large size. It can go for 48 hours before it needs a refill. There is also an ice-compartment located at the top of the unit, which is another impressive addition. When used in combination with the tank, it can help enhance the unit’s cooling effectiveness even further, making it powerful enough to handle the hottest spaces. When it comes to operating the CO30XE, it’s simply the easiest. The LED control panel is very user-friendly and the full-function remote control adds to its convenience, so operating it is a breeze. Moving the machine from spot to spot is also easy, as it only weighs around 25 pounds and has side handles along with four durable caster wheels for easy mobility on a daily basis. The only minor downside is that it is a bit noisy, particularly when the fan is operating on the high setting. However, it’s not loud enough to bother anyone when used during the day. It would only be an issue at night if you sleep with it nearby. 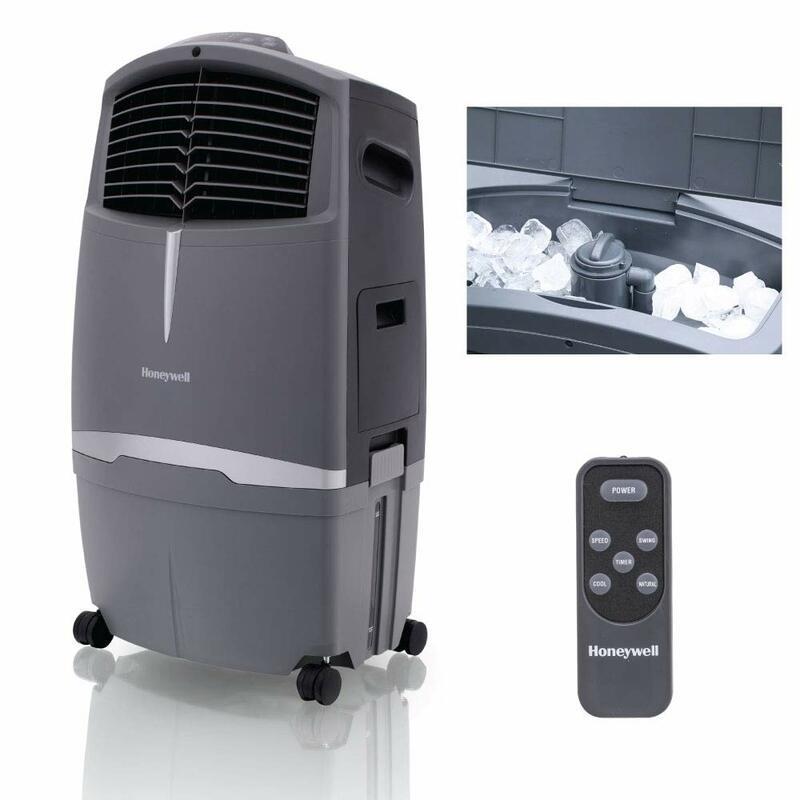 The Honeywell CO30XE is a well-built ventless portable air conditioner that will work efficiently in rooms that are 320 sq. ft. and below. It even performs more efficiently in areas with relative humidity levels of 60% or less. In short, this is a unit that gives you more bang for your buck. It will certainly not disappoint. It will efficiently cool any hot large area up to 650 sq. ft. 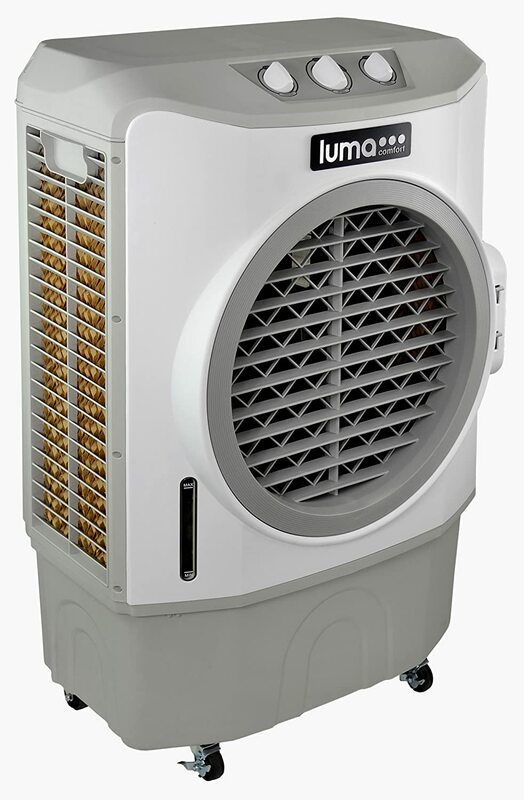 The Luma Comfort EC220W is one of the most powerful models on our list, built and designed for heavy-duty cooling. If you are looking for a unit that can handle medium to large-sized rooms, then this is a good option. 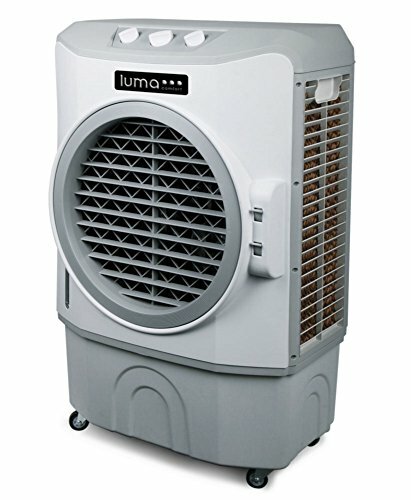 The Luma Comfort EC220W will cool the hottest part of your home very quickly. It’s a heavy duty unit with a powerful 220-watt fan that pushes the warm air through three water saturated cooling pads at a rate of 1,650 CFM. That’s a very good capacity and will cover a very large area, up to approximately 650 sq. ft. The cooling pads are located on three different sides and the fans oscillate, so the cool air is distributed evenly across the room. No matter where you put it, this unit will provide plenty of airflow to keep your space cooler throughout the hot months. As it cools the air, the EC220W filters out airborne particles, which means you get to breathe in much cleaner air. The evaporation cooling pads also function as humidifiers, so they will help deal with the irritating dryness. The water tank is big enough to accommodate up to 10.6 gallons of water. It will last three to four days, giving you enough time to enjoy the cool air before you can think again of a refill. It can even accommodate DIY ice packs, which can give an extra boost to the cooling power on the hottest days. You can add water from the bottom or top part of the machine. You can also connect it directly to a garden hose if you want a continuous water supply. It’s designed to offer complete convenience. The control panel is user-friendly and easy to operate; it also comes with a remote control, making it even easier and more convenient to operate the machine. Even much better, this unit is completely mobile. It has easy roll caster wheels and is lightweight. You will be able to easily move it wherever you want to use it, in your home or even outdoors. Like the Honeywell CO30XE above, the Luma Comfort EC220W has a 220-watt motor, so it’s very energy efficient. The only downside is that it’s a bit noisy, especially on its highest settings. It produces around 68 dB, mainly due to the powerful fan it has. The noise is a trade-off you will have to face for the exceptional performance. That said, it is fairly quiet on the first and second setting. If you are looking for a powerful ventless portable air conditioner that is capable of handling a large area and can be used almost anywhere, then this is a great option to consider. The Honeywell CO30XE is a real workhorse that will deliver great results whether indoors or outdoors. It’s an investment that definitely won’t disappoint. Powerful air flow capable of cooling a wide area up to 950 sq. ft. The Hessaire MC37M is another powerful unit on our list and takes the third spot as the best ventless portable AC. It comes with several amazing features that really boost its performance and usage. Plus, it has a simple but very aesthetically pleasing look. The MC37M has the capability to cool a large room with great ease. The unit produces 3100 CMF, which is by far the highest on our list, meaning that this unit can comfortably cool down a large room up to 950 sq. ft. This unit features three Xel50 cooling pads instead of the usual one, which efficiently remove heat from the sucked air cast out through the filter. The Xel50 cooling media delivers 80% more evaporation than many other forms of media in the same range. You will also be able to adjust the cooling capacity to your preference. It comes with 3 fan settings: low, medium, and high setting. With a 10.3 gallon tank, this Hessaire AC unit will run for two to three days before going dry and need to be refilled. One thing you will also appreciate about this unit is the filling options; you can either fill it manually or directly connect it to a hose for continuous water supply. With this option in place, you won’t need to keep on monitoring the tank to ensure you fill it at the right time. The Hessaire MC37M comes with a dial for the fan speeds as well as a handful of simple buttons for power, pump, and oscillation. The caster wheels are quite sturdy and make it easier to move the unit from room to room. However, it’s a bit heavy, weighing around 39 pounds; as such, it might be somewhat hard to carry around. In terms of overall construction, the MC37M is solidly built with a sturdy polypropylene house, which is UV resistant. It is more ideal for outdoor use but you can also use it indoors, as long as there is enough ventilation. The Hessaire MC37M is a perfect ventless portable air conditioner for those who want to cool a large room or want a unit that’s precisely designed for outdoor use. It’s durable, energy-efficient, and has the power needed to keep your home cool and comfortable. The COSTWAY evaporative AC is one of the most economical, well-performing coolers on the market. It has received several positive reviews on Amazon due to its inexpensive pricing, yet it offers some great features that you would find in much more expensive units. The COSTWAY evaporative air cooler a quality unit suitable for small to average sized rooms. It comes equipped with a superb honeycomb cooling pad that uses water evaporation to efficiently cool hot air drawn into the unit. The fan, on the other hand, is fairly powerful. It delivers 500 CFM, which is enough to keep a room of up to 300 sq. ft. nice and cool. Furthermore, this cooler is designed to ensure even distribution of the cool air everywhere around the room. It offers a swing function that, once activated, swings the blades automatically right to left, delivering the air at a horizontal wide angle. Plus, you can manually direct the air up and down by hand to make the whole room cool. Aside from adjusting the air direction, the COSTWAY ventless AC allows you to adjust the fan speed to three levels: high, medium, and low. This allows you to adjust it for different needs and occasions. With this unit, you will not only enjoy a cool and more comfortable environment, but you will also be breathing in clean air. A washable filter is included in the system to trap dust, bacteria, and other airborne particles. This unit can efficiently serve as a humidifier too, raising relative humidity to a more comfortable level to prevent air drying. The humidifier works more effectively in areas where the humidity level is less than 50%. Therefore, if you have slight breathing problems, it will make the air more breathable to you. Unfortunately, the water tank is small. It can only hold up to 4 liters of water and there’s no hose to connect it directly for continuous water supply. This is rather disappointing, but it does feature two ice-crystal boxes that you can add in the water tank to increase its cooling performance. Operating this Costway won’t present any challenge, as it has simple mechanical controls. All it takes is pressing a few buttons and turning a knob if you want to adjust the fan speed. Featuring four smooth caster wheels, moving it from room to room is very easy. Even better, it only weighs around 10 pounds, making it one of the lightest models on our list. There are also two side handles, hence you will have no problem lifting the entire machine alone. As for noise level, the fan runs pretty quietly, so you can use it even while sleeping. The overall design and build quality are good. The only downside is the small water tank and it can be somewhat difficult to remove. Fortunately, there’s a plug to pull it out. The COSTWAY evaporative air cooler is a versatile, inexpensive unit that can perform efficiently in a small room. Furthermore, it has a very stylish design that would look good with any modern room décor. Even with the water tank being quite small and a pain to remove, at such an economical price, it’s a unit worth investing in if you only have a small room to cool. 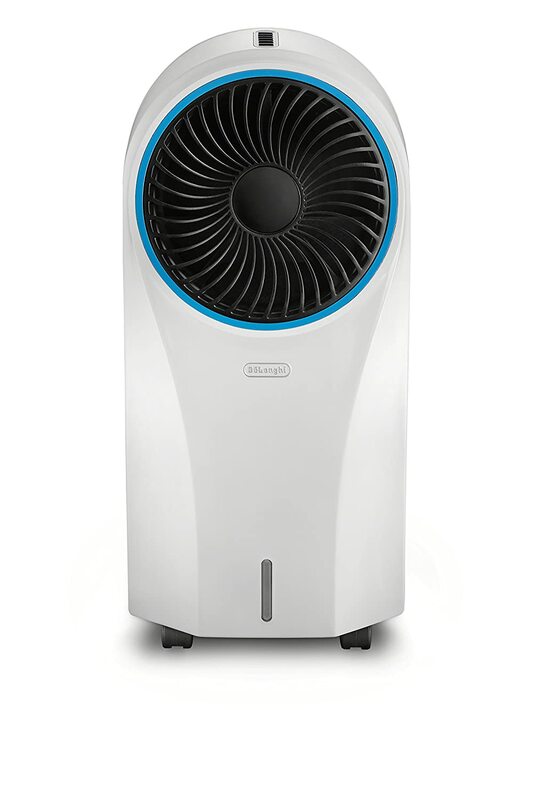 DeLonghi has a built a good reputation for itself for many years now with its high-quality products, and this EV250WH portable evaporative model does well to affirm this reputation. It has a great price to value ratio, providing an energy efficient way of cooling down a warm environment. It lacks any compressor and has a very energy-efficient design that offers simple yet effective operation using a minimal amount of electricity. The cooler draws in warm air and transforms it into a cool breeze of fresh air using an internal water chamber and then distributes it efficiently around the room. The fans are fairly powerful, delivering an airflow of up to 206 CFM, which is just enough to cool a small room of up to 200 sq. ft. This AC unit features a motorized internal swing system that creates an oscillation effect and broadens the air circulation range, allowing the cool air to distribute evenly within the room. The louvers are as well adjustable either up or down, giving you the opportunity to control the vertical circulation direction. Together with the swing mode, they work quite well to keep the air well mixed and distributed. You also have three fan speeds and three wind modes to choose from, allowing you to completely customize the air circulation and achieve the comfort level you desire. The built-in-ionizer is another wonderful addition that ensures you get a clean and fresh breath of air every time. Its unique filter system helps clean and freshen stale room air before it is released back into the room. While the cooling performance of this DeLonghi model is commendable, much like the COSTWAY evaporative AC above, the water tank on this unit is very small; it is only capable of holding 1.19 gallons of water. That’s quite low, and can only last for a few hours, which leads to more frequent inspecting and filling. The EV250WH offers hassle-free operation and fairly intuitive contols. This unit’s buttons feature textured rubber, which makes it easy to press them without your hand slipping. The unit has a small but easy-to-see LED display that show the setting the system is on. This unit comes with a remote, which means you will be able to control all the key functions at your leisure. It also features a 24 hour programmable timer, allowing you to schedule the system according to your needs and lifestyle. This unit weighs 16.22 pounds, making it relatively light; unfortunately, it doesn’t have any handles on the sides, so it will be a bit tricky when you want to lift it up. However, the wheels make it easy to move around, provided that you are not planning to carry it up or down the staircase. When it comes to noise, the fan is incredibly quiet; even when running on a high setting it only produces a maximum of around 53 dB. If you are looking for a portable ventless air conditioner for temporary heat relief that is both efficient and cost-effective, this is it. The DeLonghi EV250WH portable evaporative AC will cool, humidify, and improve the air quality around you, without sending your power bill up through the roof. For the price and the several great features it comes with, this is a superb unit that we would recommend for anyone on a budget. A standard ventless portable AC can cost up to 50% less than an equivalent window AC and around 70% to 90% less to run. 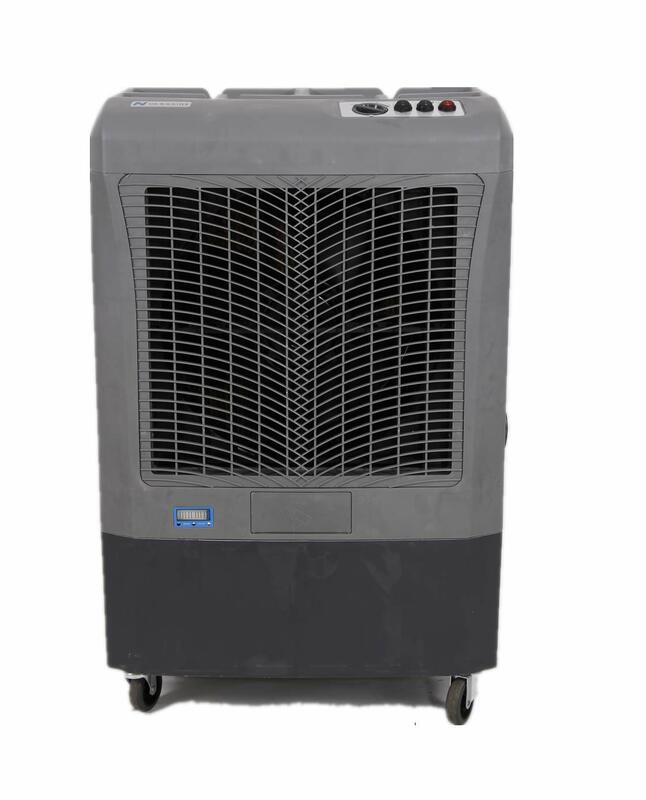 A ventless portable AC is also often meant for small spaces and as such is designed to consume less power compared to a window or central air conditioning unit. The best aspect of ventless portable ACs is that they don’t utilize any chemicals and often feature air filters that remove impurities from the air. In addition, a ventless portable cooler doesn’t dry out the air, but rather adds moisture back into the air through the damp pads. This makes such AC units ideal for dry climates, as they can help maintain a healthy natural humidity level. All ventless portable ACs are quite lightweight compared to their counterparts and often have handles on the side, making them easy to carry around. They are great for regular travelers. They are also very mobile, as they come with four caster wheels that facilitate easy movement and maneuverability from one place to another. If you want an AC that you can use in different rooms, then a ventless portable is designed to allow that. A ventless portable AC offers the best way to cool a space without harming the environment. While most window and central ACs use chemicals that can damage the environment, these units employ a natural process that uses water and motion to cool the air, a process that won’t add any chemicals or ozone-harming pollutants to the environment. If you are a light sleeper or not a fan of the distracting fan noise common in window and central air conditioners, then you will love ventless portable ACs. They are much quieter than both window and central ACs, with most models producing a maximum of 55 dB on high settings and 50 dB on low settings. A ventless portable AC is the easiest AC unit to install because it doesn’t need permanent installation. You don’t have to be a professional in order to install it in your room and you can do it with minimal knowledge and basic tools in less than an hour. All it takes is identifying a suitable spot where you can place it and plug in the power cord. When it comes to maintaining a ventless portable AC, the cost and maintenance requirements are much lower than that of window and central AC systems. Ventless portable air conditioners provide a very efficient way of keeping your home cool and comfortable during those hot summer days. Although they are more efficient in dry environments, they can still perform well in areas with relative humidity levels. However, choosing the best model that will perfectly address all your needs requires careful evaluation; our guide above can help to make this process much easier. It’s our hope that aside from the guide, our comprehensive reviews above can also help you narrow down your choices to that one unit that’s perfect for you. All the models on our list are solidly built to last and come at a highly competitive price. They are the most ideal options to consider if you don’t want to go through all the trouble of extensive research to determine which the best units on the market are. To ensure that you are armed with all the right information before you purchase your unit, we are going to answer a few important questions that often arise when it comes to buying a ventless portable air conditioner. What is a Ventless Portable Air Conditioner? 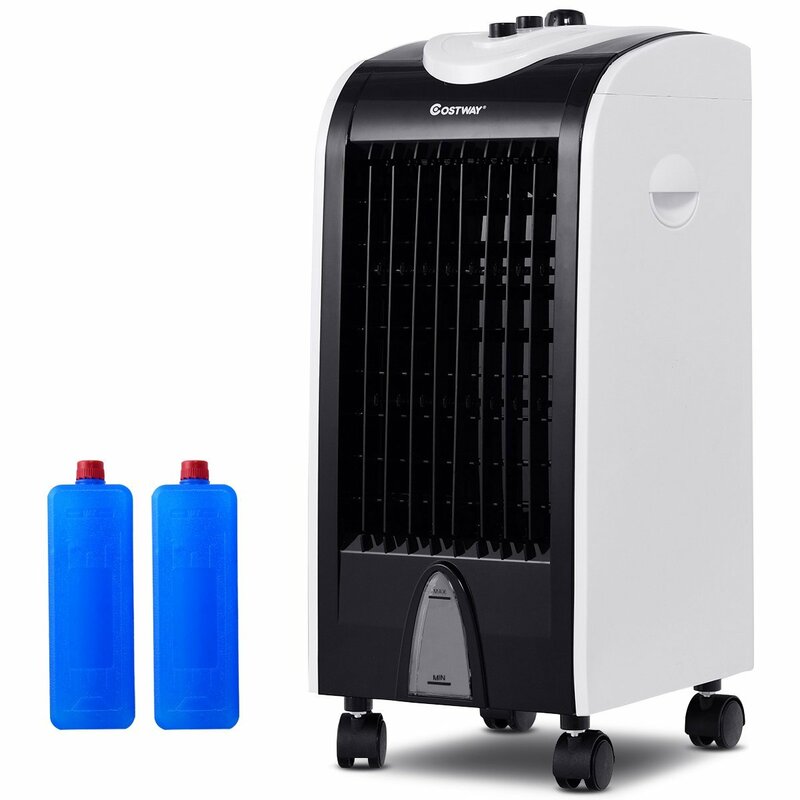 A ventless portable air conditioner is a compact air cooling system that features no exhaust horse and can be moved from place to place with ease. Unlike window or central air conditioning units, ventless portable AC units do not need permanent installation and do not require an expert to install. How Does a Ventless Portable Air Conditioner Work? These units cool the air by drawing in hot air from the room and passing it over water-soaked cooling pads, where water evaporates into the air and takes the heat from the air molecules, thereby lowering the temperature of the air. The cooled air is then distributed throughout your environment by the fan. Where Does the Heat Go on A Ventless Portable Air Conditioner? Ambient heat from surrounding air molecules is utilized to evaporate water into the air; that water vapor then absorbs heat from those air molecules. To maximize the performance and efficiency of a ventless unit, you can place it closer to a window, a door, or any other opening that can allow fresh air into your space.